Using the software SketchFab we have produced a 3D visualisation of a part of the Langtang glacier in Nepal. The model allows an interactive inspection of the surface features of the glacier. It shows the huge variation on the surafce of the glacier including different types of lakes, ice cliffs, boulders and bare ice. It is also possible to view this 3D model using VR glasses and a Google Cardbox on your smart phone. Enjoy! Mountain ranges in Asia are important water suppliers, especially if downstream climates are arid, water demands are high and glaciers are abundant. In such basins, the hydrological cycle depends heavily on high-altitude precipitation. Yet direct observations of high-altitude precipitation are lacking and satellite derived products are of insufficient resolution and quality to capture spatial variation and magnitude of mountain precipitation. 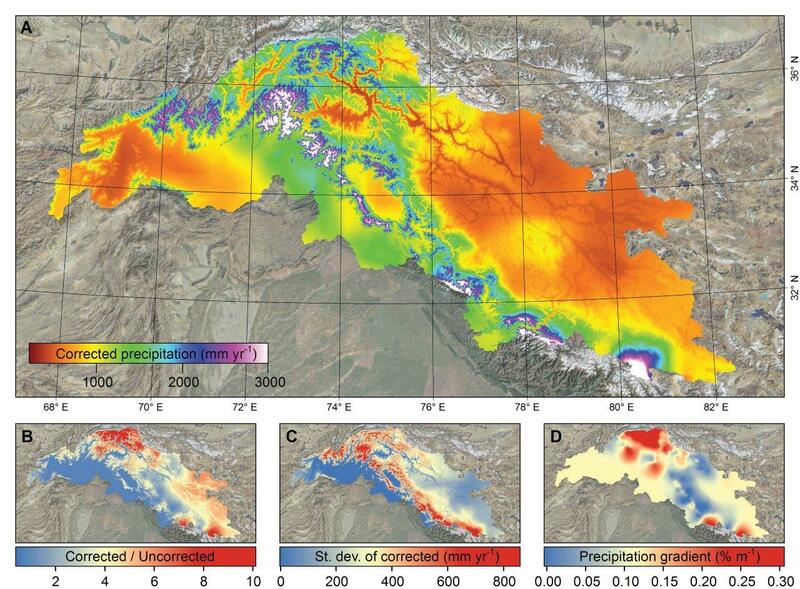 Here we use glacier mass balances to inversely infer the high-altitude precipitation in the upper Indus basin and show that the amount of precipitation required to sustain the observed mass balances of large glacier systems is far beyond what is observed at valley stations or estimated by gridded precipitation products. An independent validation with observed river flow confirms that the water balance can indeed only be closed when the high-altitude precipitation on average is more than twice as high and in extreme cases up to a factor of 10 higher than previously thought. We conclude that these findings alter the present understanding of high-altitude hydrology and will have an important bearing on climate change impact studies, planning and design of hydropower plants and irrigation reservoirs as well as the regional geopolitical situation in general. Immerzeel, W. W., Wanders, N., Lutz, A. F., Shea, J. M. and Bierkens, M. F. P., 2015, Reconciling high altitude precipitation with glacier mass balances and runoff, Hydrol. Earth Syst. Sci., 12, 4755–4784.